'']] John K. Brandt was born 3 September 1891 in the village of Wasilovka, [[Naumenko Mennonite Brethren Church (Kharkiv Oblast, Ukraine)|Naumenko Colony]], South [[Russia|Russia]]. He was the tenth child born to Kornelius and Margareta (Rempel) Brandt. Five older siblings had died in infancy. A younger brother also died in infancy, leaving John as the youngest in a family of five. John K. Brandt was born 3 September 1891 in the village of Wasilovka, Naumenko Colony, South Russia. He was the tenth child born to Kornelius and Margareta (Rempel) Brandt. Five older siblings had died in infancy. A younger brother also died in infancy, leaving John as the youngest in a family of five. 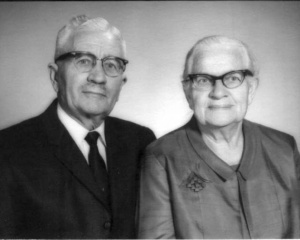 John and Anna Brandt had twelve children: Peter J. (and Ruby) Brandt; Edwin C. (and Anne) Brandt; Esther A. (and Henry) Born; Herbert (and Anne) Brandt; Victor A. (and Margaret) Brandt; Elsie M. (and John) Braun; Evelyn J. (and Carl) Braun; Allen S. (and Elizabeth) Brandt; Elenora Brandt (died as a child) Ethel B. (and Peter) Suderman; Bernard B. (and Rose) Brandt; Gilbert G. (and Susan) Brandt. Brandt, Gilbert G. "Brandt, John K (1891-1972)." Global Anabaptist Mennonite Encyclopedia Online. September 2002. Web. 22 Apr 2019. http://gameo.org/index.php?title=Brandt,_John_K_(1891-1972)&oldid=75957. Brandt, Gilbert G. (September 2002). Brandt, John K (1891-1972). Global Anabaptist Mennonite Encyclopedia Online. Retrieved 22 April 2019, from http://gameo.org/index.php?title=Brandt,_John_K_(1891-1972)&oldid=75957.